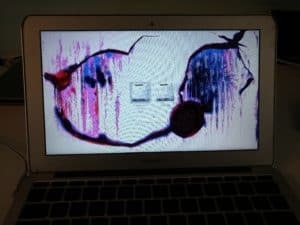 This is a perfect example of a cracked LCD panel on an 11 inch MacBook Air. Purple, pink, and black blobs and smears all over the screen. It almost looks like ink is leaking out through the cracks. The laptop was dropped, in addition to the broken screen there are also dents on the corners of the display. Those are just cosmetic defects, and will still be there after we finish fixing the MacBook Air’s screen. The screen repair for this laptop is pretty affordable through our mail-in service at the shop.